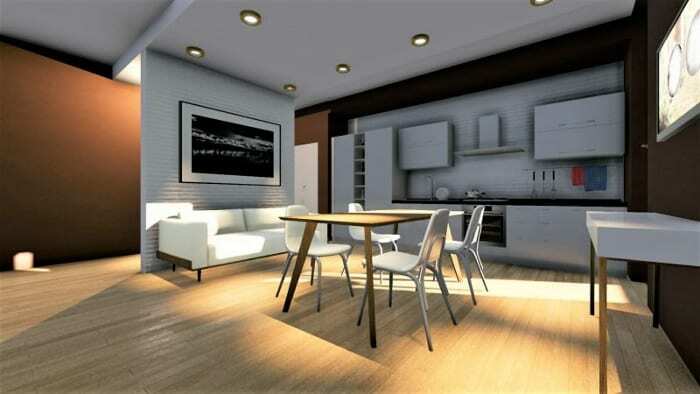 In this post we will show you how to design a 1-bedroom apartment. 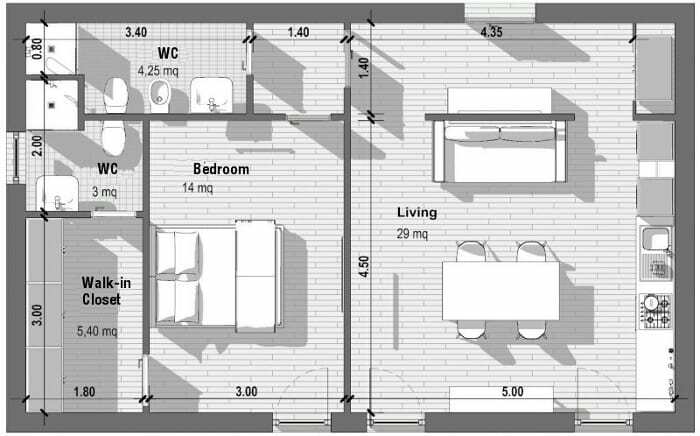 We’ll provide a guide with layouts rules, dimension criteria and some national regulatory requirements, paying special attention to the most common types of 1-bedroom apartments (40 and 60 m²). 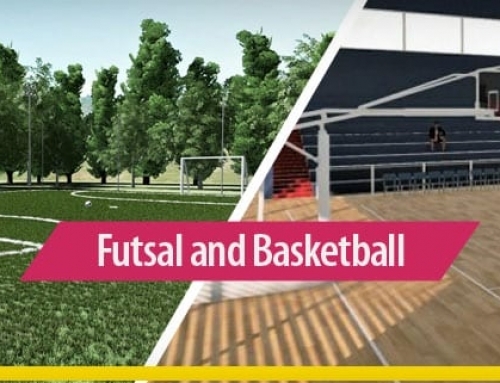 The project with relating technical drawings will be further described in detail. 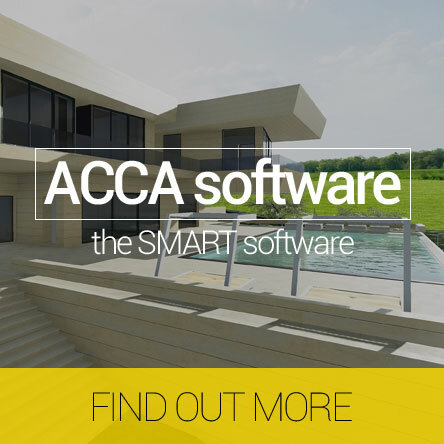 Download and try Edificius, the 3D architectural BIM design software, for free! distinct environments and functions, overcoming the limits of reduced sizes, with living and sleeping areas occupying independent rooms. 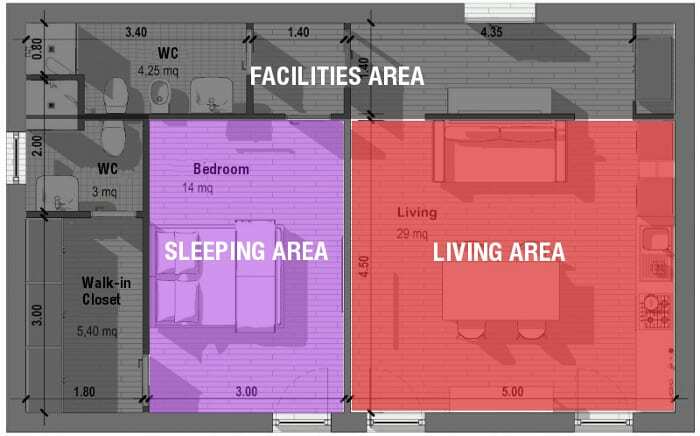 This second solution is what better defines the 1-bedroom apartment. The a-bedroom apartment is a type of residential property that has two rooms and services: the sleeping area, with a bedroom, and a living room / kitchen. 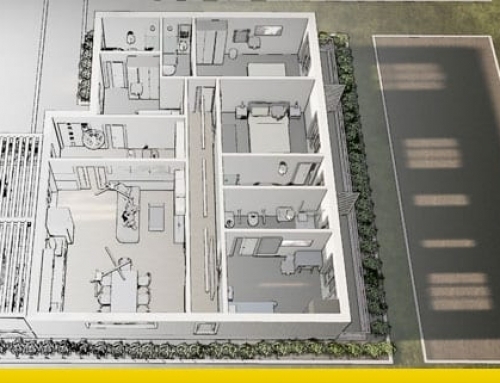 Commonly, this type of housing is suitable for one person or a couple, given the lack of a second bedroom. Each country defines minimum living requirements per apartment and/or room, in relation to the number of residents. In some cases, these regulations are implemented at national level, while in others, on regional, district or even municipal levels, such as in the United States or in Spain. This project has been studied in order to optimize spaces, given the limited size available. 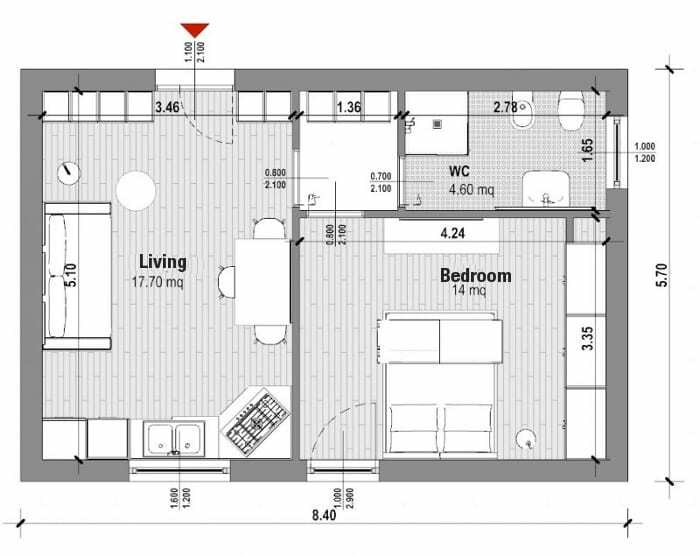 The apartment floor plan is rectangular, with the longest side of approximately 8.60 m and the shortest side of 5.70 m and it is divided into living and sleeping area. The entrance is located on one of the main sides. You can enter directly into the living room that forms the core unit of the house. The living room occupies approximately 18 m², it is configured as a totally open space and includes both the kitchenette and the living room for a functional distribution of spaces. The door opening is located on the smaller side leading to the sleeping and service areas. The hallway that connects the 3 rooms occupies as little space as possible, in order to respect the minimum size of living room and bedroom. 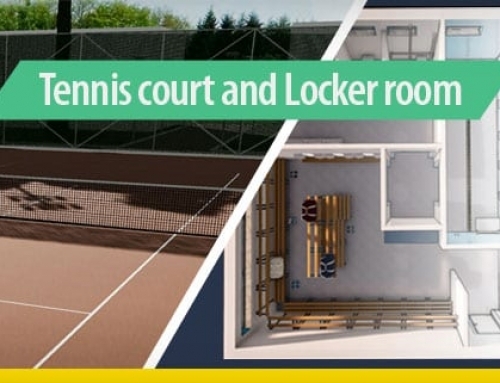 All connection spaces are equipped with cabinets, so as to optimize the use of passage areas. All areas are also equipped with openings that comply with the lighting-ventilation ratios required by standards. Modern and functional furnishings together with neutral and bright colours materials have been chosen to improve the quality of spaces. 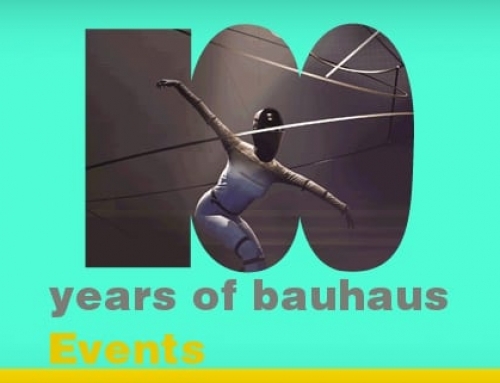 The accommodation has a rectangular surface of about 60 m², with the longest side of 10.00 m and the shortest side of 6.00 m.
Rooms are arranged according to a planimetric layout that can be set with a series of interconnected rectangles. The service areas and hallways are located along the two adjacent sides of the floor plan rectangle. 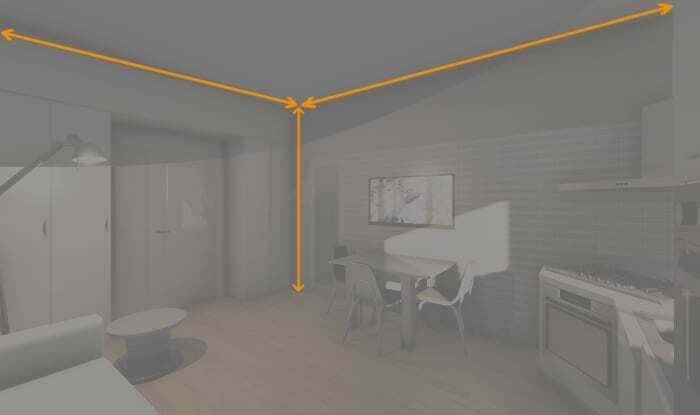 The entrance to the accommodation is separated from the rest of the living space by a “partition wall” that prevents those who enter to have an immediate and complete view of the living room and kitchenette. From the entrance you can access the living room, through the two side entrances next to the “partition wall“, while you can enter the sleeping area and services through a door on the right side of the entrance. The living room is strongly characterized by a contrast of white bricks and brown walls and by a false ceiling that starts from the entrance and divides the room in two. The use of colours helps to create movement within a single open space accommodating a kitchenette, the dining and living rooms. 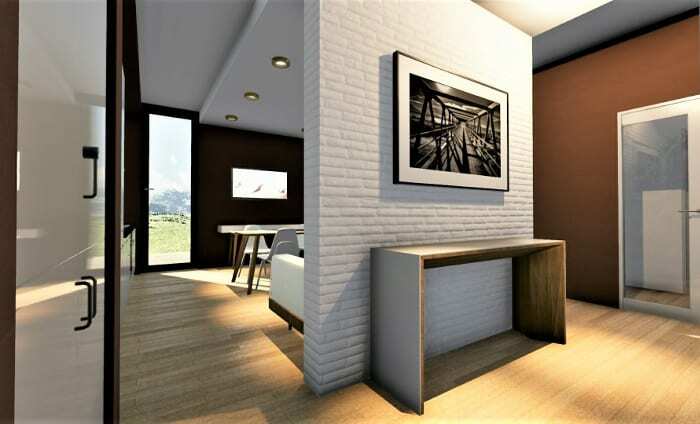 The hallway leads to the main bathroom and 14 m² bedroom, with adjoining walk-in closet and private bathroom.